Evaluating the relative importance of ecological, evolutionary and biogeographic processes in the generation and maintenance of biological diversity remains a fundamental challenge in biodiversity science. To date, most studies have focused on taxonomic diversity and have paid relatively little attention to other dimensions of biological diversity, such as phylogenetic (or genetic) and functional diversity. As a result, biodiversity scientists know relatively little about how these three dimensions (taxonomic, phylogenetic and functional) relate to each other and which ecological and evolutionary processes influence variation among the dimensions. 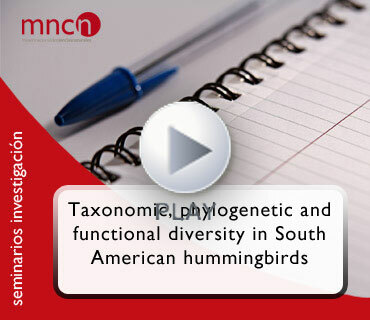 In this seminar, the speaker combines taxonomic, phylogenetic and functional beta-diversity in hummingbirds across strong environmental gradients and varying degrees of isolation in northern South American hummingbirds, and evaluates how different mechanisms, including dispersal limitation via geographic barriers, conservatism of functional traits and rapid radiation of lineages, might influence contemporary patterns of diversity. Presenta: Miguel Bastos Araujo, investigador científico del Departamento de Biodiversidad y Biología Evolutiva, MNCN, CSIC.